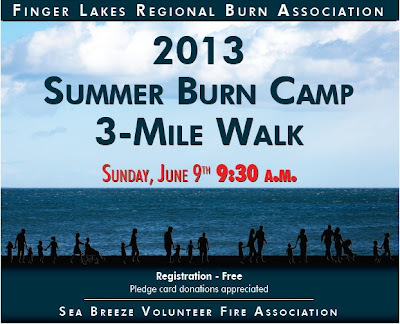 Enjoy a beautiful day of fun and fitness at Durand Eastman Park and Seabreeze Amusement Park, all while raising the support necessary to send a youth burn survivor to FLRBA's "Camp Courage" summer burn camp. Parking and check-in for this event is at Seabreeze Amusement Park where you will take a Shuttle Bus to the starting point at Camp Eastman in Durand Eastman Park. All Pledge Cards of $40.00 or more receive a free event T-shirt. All Pledge Cards of $80.00 or more receive free Seabreeze Park event-day entry pass & event T-Shirt. Register for this year's "Camp Courage" Burn Walk by clicking HERE. Challenge your friends, family and coworkers to Pledge and participate in this year's event. Download the 2013 Burn Walk Pledge Card or Poster.